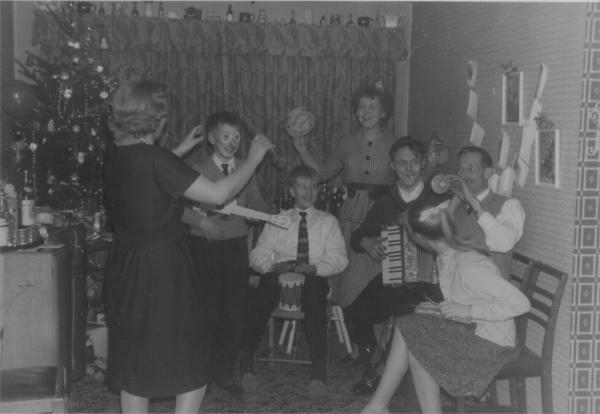 British TV and Radio Snippets - The way Christmas once was! Home > Snippets > The way Christmas once was! The way Christmas once was! But to actually receive a letter from someone you know. A tangible piece of paper with that persons writing on it, its so personal. A joy to be kept and viewed years later to remind you accurately of what happened. You should get your kids to write a letter to each other describing their Christmas AND post it. AND to keep it safe. AND read it in 50 years time! I went in our loft the other day to get down our Christmas stuff. Like most people, up there are things from my past, a toy of my daughters, 45 records, LPs, books, A toy fort I used to play with at my Aunts (more of that soon) and whats that? I think around 1957 age 7. .Dad! Father Christmas has been! Can I go downstairs, please? And whats this yellow thing? Thats a banana son, try it, youll like it. Yes you can go downstairs now. Flippin eck! A Beano Annual from Aunt Phebe & Uncle Rolf! And from Auntie Jessie and Uncle Stan a Bagatel game. A balaclava knitted by Nan. But wait! (shrieks of joy) Mom. Dad! Its a TRAIN SET! (It cost Dad £5.00 a huge sum in those days) This was the best Christmas EVER! A Train Set!) he gets out the starting handle, it takes him some 7 or 8 goes to get it started, off he chugs. My Auntie Alice, who is staying with us, comes downstairs in her hairnet with bits of rag for curlers, cuddles me and asks what Father Christmas has brought. I delight in telling her about my train set and like a good boy dutifully thank her for her present of the book. Its our turn for breakfast. I have Cornflakes then my favourite of fried bread with a little tommy sauce, Auntie has some toast, toasted on a long fork in front of the fire, which is now roaring in the grate. Mom cooks the piggies in blankets (little sausages wrapped in bacon) and finishes off the roast pork joint for the meal later. I go outside to play with my friends for a bit. We would discuss our presents and one would be riding his new bike, another on a new scooter. Even in snow we would play cops and robbers! High noon would be played out with two boys facing each other; guns in holsters, whoevers cap fired first won. At about 11.00 a.m. Me, Mom and Auntie Alice would set out walking through the snow the three miles to Auntie Edna (Moms sister) and Uncle Charlies house. Dad would collect some of the food, drink and my toys later. We arrived to a wonderful smell of a huge turkey roasting in the oven and a roaring fire. Mom and Auntie Alice would don their wrap round pinafores and join Auntie Edna and Nan in the kitchen. How they ever did anything together amazed everyone. The kitchen was only 3 metre by 2 metre! But Christmas day was the exception. The women worked together like a well-oiled machine. Our Dads arrive in the Rover with Charlies bike sticking out the back. It was unspoken but everyone knew they had stopped for a drink at the Fox & Goose. Now I think about it I suppose their red noses, louder than usual chatter and slight unsteadiness should give it away. ..Amen Bearing in mind that most of the year we all ate simple but wholesome fair, the bountiful feast set before us was a sight to behold. My Dad usually carved. He would make a big show of sharpening the carving knife with the steel. It was like watching a sword fight, his hands going up and down alternately making a loud swishing clackerty clack noise, a huge grin on his face. The meal would be eaten at a leisurely pace, with everyone chattering back and forth. 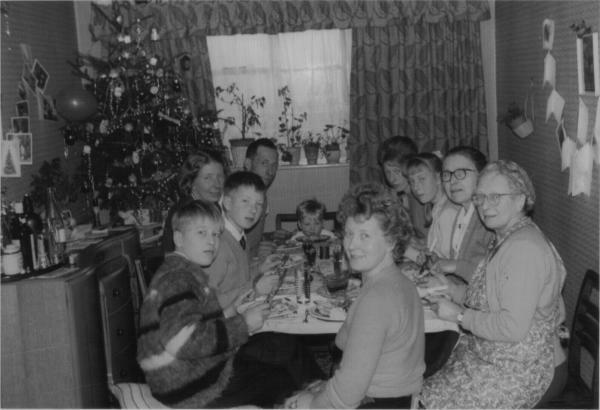 While the ladies cleared up the crockery and quickly washed up, Aunt Alice, who was a very gentile lady, would go round the table collecting the unused cutlery mumbling about counting your blessings. The men would raid the drinks table for a liqueur [my Dad loved his Drambuie as do I] and tea or coffee would be served up. 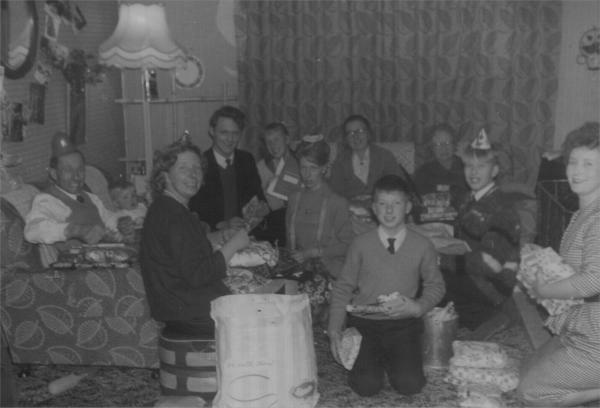 Now was the time us younger ones would say Can we have our presents now Mom? to which the stern reply would be Not until we have seen the Queen! The reverence for the Crown was very prevalent in those days. Men had fought for King and Country and it was still in recent memory. So we all dutifully sat down to watch Her Majesties Christmas broadcast. The Queen was switched on at 3 oclock, and her observations and wishes which were all greeted by our elders. The TV set was then switched off and was not switched on again that day. During the afternoon us kids would play with our toys, I would get to play with my train set and Robert with his. The elder girls would retire upstairs to do whatever girls do. The men would fall asleep on the sofa and snore away and the ladies would talk, talk for a bit and then talk some more. Around 7 oclock out came the chicken sandwiches, all manner of cakes and delicious Typhoo tea. Dad would then return Aunt Alice to our house in the Rover so she could watch TV and get to bed early. And Nan would be walked home a few hundred yards for her to do the same. Earlier in the evening Carol Ann had trudged off to the phone box to telephone her boyfriend. He duly turned up on his motor scooter. Carol Ann went out in that freezing weather with her frilly skits, bobbed hairdo, bobby socks with just a small jacket, sitting side saddle and loving it, off to the dance with her Beau. Then the fun started. The evening would consist of playing the latest records on the record player, playing party games, with the adults slowly getting drunker as time went on. I honestly dont remember ever getting bored or asking for the TV to be put on. We all played, talked and laughed till we cried. Us boys were put to bed around half past nine, totally tired out. I slept with Robert in his single bed [Remember we were 7]. We played for an hour or so with those wonderful torches and fell asleep. The elders, a few more drinks later would call it a day, Uncle Charlie had to get up at 4 a.m. for his milk round. My Mom and Dad walked the 3 miles home in the freezing snow, I suspect not feeling the cold due to their alcohol intake but giggling all the way. Still so very much in love. We were all tucked up beneath our eiderdowns and asleep before you knew it. Another great Christmas with loving family No Central Heating, carpets, TV [almost], smart phones, computer games, I wouldnt swop those memories for the world.